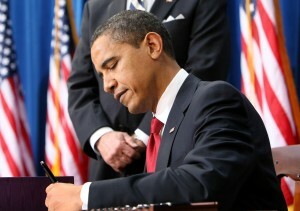 This is what it will look like when President Obama signs ENDA… only hopefully he’ll be smiling. A total of 110 U.S. House members have signed a letter calling on President Obama to take action to protect LGBT workers from discrimination — although the letter has the notable absence of members of Democratic leadership and Republican lawmakers. The lawmakers are calling on Obama to sign a much sought-after executive order requiring federal contractors to have non-discrimination protections for their LGBT workers. The latest missive comes on the heels of similar letters that were sent to President Obama earlier this year. One was signed by 37 U.S. senators, the other was signed by 54 LGBT advocacy groups. In response to each letter, the White House has restated Obama’s support for the Employment Non-Discrimination Act, legislation that would protect LGBT people against workplace discrimination. House Minority Leader Nancy Pelosi (D-Calif.) isn’t among the signers, though she supports the letter — as a rule doesn’t sign group letters because of her position as House minority leader. Posted March 21st, 2013 & filed under Politics.